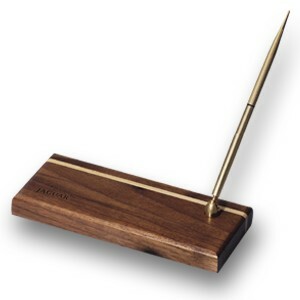 Elegance and function in a quality pen stand with gold metal pen and your logo. The only answer when you are looking for style. Each piece is hand-crafted from solid American Walnut, accented with a Maple stripe. A unique look guarantees a permanent place on any desk. 50 pcs. / 31 lbs. Laser Area: 2' x 1"